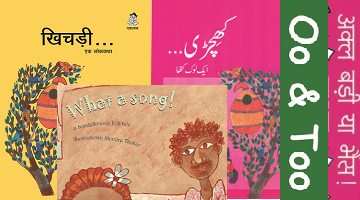 These books are a collections of poems, rhymes, songs profusely illustrated using conventional, contemporary and folk art forms to introduce children to the rich styles of Indian art. They have an essence of our soil, tradition and it is still very popular in all regions. An amusing story of Birju and his love for khichdi. This book makes a good classroom read-aloud reso..
An applauding attempt to keep the Bundelkhandi language alive in written form through this collectio..
A bilingual (English-Urdu) Oriya folktale beautifully shows the cyclic and intertwined nature of lif..
A bilingual (English-Hindi) Oriya folktale beautifully shows the cyclic and intertwined nature of li..
Oo & Too is a great children’s story. It gives the mind a rest, has play in its language, entert..
A woman is upset… Why? She doesn’t know any songs. Thus, begins the search for a song. Finally, the ..